Hi Friends! 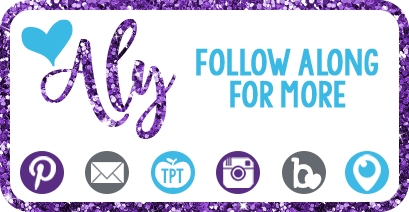 I am beyond excited to be blogging today. I enjoy blogging, but it is H.A.R.D. to do during the school year. 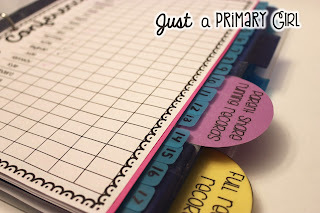 I have been using my new tracking system for the last two-three weeks (adjusting and adding ideas) and I have what I think is the best for my class data tracking goals. Let me say, I have a love/hate relationship with data. When I have to track my students for gap groups - I HATE it. I HATE physically testing students. Hate it. Did I say I hate it? We are talking about six year olds. However, I will say that when I do conferences and report cards, I LOVE seeing their progress. I like seeing how they have increased in fluency or finally gotten that writing goal down. I love sending home notes of success in my room. I love giving my students praise. Here was the problem. 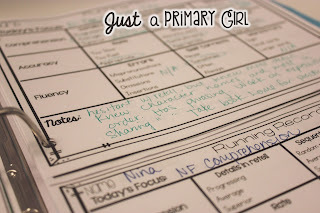 I couldn't keep track of my running records, anecdotal notes, and writing conferences. Let me tell you, I have tried it all! I used avery labels and put them on student pages, but the labels were too expensive. I had mini notebooks - one for each student in a bin - man was that hard to keep up with. I tried a binder before, but just couldn't get it right. Let me stop boring you with my failures. On to the success! 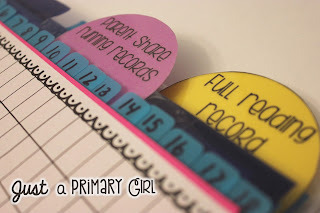 Here is my data tracking, running record, writing conferences binder! Let's talk about how pretty this binder looks!!! The bundle comes with a reading, writing or both cover. Probably my favorite part about the organization part of this binder is the tabs! I made my own tabs. I did include the editable tabs in my pack so that you can do the same! The tabs are circles in my pack. I used 5 MIL lamination sheets from Amazon and astrobright papers. The lamination sheets are thick enough that I can be confident that they won't bend and crumble. You can find the lamination sheets here. I then used clear packing tape (a good brand) to secure. I have included a 100 square running record (it also has another 100 on the back for longer stories) I have a running record info sheet on the bottom. I also wanted my parent share page. The cool thing about this one is that the top half is bigger (goes a bit beyond the second hole punch), then the next is the same exact thing, but a bit smaller, so that it fits below the middle hole punch. I fill them both out, and the bottom gets cut off, and sent home with my student to share with their parents. I then have the top side to add to their file. This helps so much with report cards! 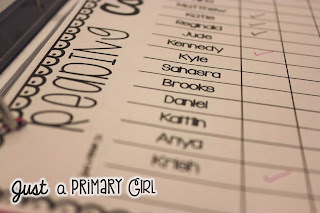 Included in the pack is the Reading Conference checklist, so that you are able to write in your students names and keep track of how often you are meeting with your students, so that you don't over meet, or under meet. The blue tabs are from walmart. I will add them to the back of each page. As the pages fill up, I will keep the most recent at the top, so that I don't need to replace tabs. These fit pretty perfectly. I have 21 students, and 20 fit without overlapping. To get over that, you will need to either overlap, or you could trim these. I lucked out. It makes it super easy to find which student I need to keep track of. Now, let's move on to the Writing Conference Notes! These are going to be amazing when I start my report cards on Monday. I am going to be able to show progress over time for my students. I take notes that say if a student liked a particular writing, what the strengths and weaknesses are as well. There is a note section too. These are the ones I use mostly in my class as you can see. 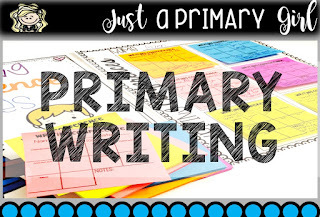 I have included a kindergarten/first grade or early writers checklist, that you can actually hand to a child and have them focus on what you have asked. I have also included a checklist for upper grades 2 and up for their focus for a student or for teacher record. You will also get the writing conference sheet along with the sheets to put the sticky notes on to organize. I hope you find this all helpful! This pack is on sale for the rest of Sunday. If you want ONLY the writing pack, click here. If you want ONLY the reading pack, click here. 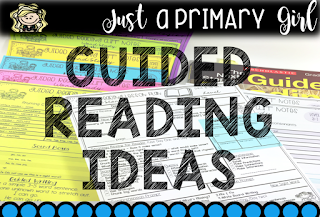 If you want the reading pack WITHOUT sticky note versions click here. Comment with your name and email along with HOW you collect data for writing and reading. I will pick one to win this bundle for free!!! I will choose a winner on Monday evening! I usually use the big binder our intervention team provides. it a new thing this year but it is horrible and not well organizef. This would be awesome to introduce in my classroom. Wow! This is totally, totally the best thing I've seen. I am just like you; I've tried every method of tracking, but with no such luck! This will definitely make life so much easier! Thanks for a chance to win this awesomeness! I have a messy binder that holds the paper copies of running records and spelling inventories. I also use Google forms to track my data from reading conferences in a spread sheet. OMG! When I read your post, I thought I was the one who wrote it. Describes my crazy record keeping! I have a huge binder stuffed to the brim with sticky notes and running record papers spilling out. My kids find them on the floor and bring them to me. This would be #LIFE CHANGING!! Thank you for the opportunity to win this awesome bundle! My data collection is a hot mess!!! Stickie notes everywhere! A binder with running records, spelling progress and writing progress written on anything I can find at the time and then not put into binder promptly. This system seems like a dream, just what I need. Thank you for creating such a wonderful resource! I collect my reading data in a binder. I have it sorted by reading group based on their GRL. I have a check list for each student with a small line for comments. For writing, I collect the information in my iPad using numbers. I create a new sheet for each piece of writing they do, I make comments about what they are doing good at and what they need to workout on. I loved this post! It is so inspiring to see everything you are doing to inform your parents and students about each level and their progress. I have been very interested in studying reading levels and such since a literacy class in college and plan to pursue my masters in reading starting next year. This has renewed my research information for the information I have been working on to cater to my new classroom. Where did you find alot of your information. We use DRA mainly in my classroom, but I used GRL for the students to easily pick out books, but we pay attention to lexile levels as well and I am having trouble finding the comparisons between all of them grade level wise. Do you have any good website suggestions? What website do you use to print your sticky notes?